I really, really, really, need warmer weather so I can dive head first into a painting frenzy which is holding up a bunch of other projects. Unfortunately, the weather has been right on the line in terms of acceptable temperatures, and even more sketchy with respect to how much curing time can pass before probability of precipitation kicks in. The result of all this has been my having to drift a little off the critical path with some projects. There's still plenty to do. 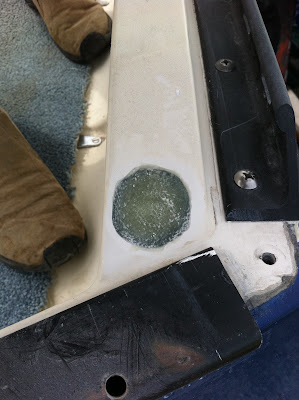 I have been able to plug the transom hole where the old rail mounted tank hose was routed. My trusty Dremel tool ground the hole out efficiently and cleanly. I then put in about 10 layers of 10 oz. cloth cut into small circles. 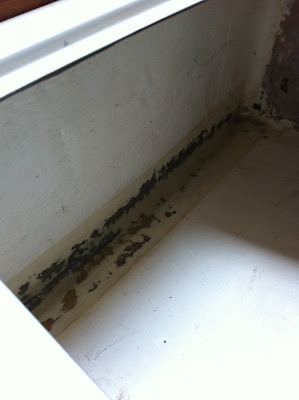 The repair came out great; I'm actually beginning to feel like I know what I'm doing with this stuff. 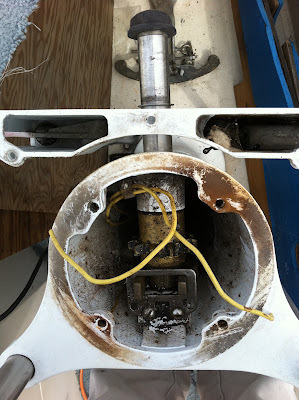 I also spent some boat-yoga time in the hanging closet grinding out the old post which housed a depth-sounder back in the good old days before the through-hulls were added. This thing was not only filled with nasty 30 year old goop, but also prevented the space from being used for anything else. Now that it's ground down I will paint that locker and it will be useful again. The other big project I completed today was re-tabbing the settee locker closest to the ice box. There was a minor stress crack in the gelcoat there, but since I've retabbed all the other lockers I figured I may as well do this one too. I don't ever want to deal with it again, so may as well do it now. I ground out the cracked area, then ground all the surrounding area well for good measure. Did a little acetone clean up, then a 2" strip of 10 oz. cloth to secure the stress cracked area, and a top coating of wide 6 oz. cloth. A quick polish with a sander and it will be ready to paint if the weather ever allows it! This pretty much wraps up all of the interior structural work, so I'm done making fiberglass clouds for a while. 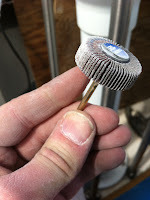 And, the last project to wrap up today was extracting two completely frozen and corroded bolts from my Edson pedestal. I'm planning to remove the old style shift and throttle, and replace with a newer two-lever design which makes MUCH better use of the space. Unfortunately, I couldn't do much with those stuck bolts. This project was a real head-banger, but it came out ok with a combination of Dremel grinding, drilling, penetrating oil, hammers, and punches. So, the hull is still ugly as sin while it awaits paint, but I'm moving forward a little bit each day.